Alayna did eventually apply to the IU School of Nursing, but was unsuccessful in her first attempt. It was then that she turned to the Health and Life Sciences Advising Center for help. She met with both a student success advisor and a career consultant to go over her different options, which included reapplying to nursing school and considering a parallel plan. 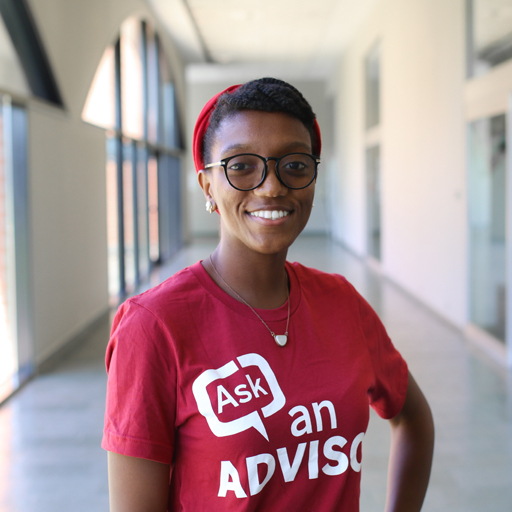 After meeting with Health and Life Sciences Advising Center career consultant Keely Floyd, Alayna’s eyes were opened to the idea of considering other health care majors, especially those that had less intense science courses and more courses focused on communication and interpersonal interaction. She had not yet given up on giving nursing school a second shot, but she was starting to really enjoy some of the different aspects of majoring in community health. Since the day Alayna met with Keely and brought homemade cookies as a “thank you,” she flourished here at IUPUI. Alayna became involved on campus and credits a lot of her personal growth to the various opportunities she experienced at IUPUI, including being a peer advisor in the Heath and Life Sciences Advising Center and a lead peer advisor for a year, an international peer mentor, a Summer Bridge and first-year seminar mentor, and even participating in a research project with IUPUI faculty. Through her participation in many of these on-campus programs, Alayna learned that what she loved the most was working with people. She especially enjoyed learning about those from different backgrounds and different cultures. Alayna decided that a career in community health through the Fairbanks School of Public Health would allow her to learn and to engage with all different groups of people, as well as discover ways to help improve the lives of the various individuals in a community. Get to know everyone around you! The most important things you can do as a student is talk to people, get involved, and ask for help when you need it! All of these experiences led Alayna to accept a well-deserved, full-time job offer after she graduated in December 2017. Alayna joined the Center for Citizenship and Community (CCC) staff at Butler University for 2017–18 as an Immigrant and Refugee Service Corps (IRSC) member through the AmeriCorps Program. In this position, Alayna will focus on building and strengthening partnerships with Butler’s immigrant and refugee communities and assisting with projects that connect students, faculty, and staff to immigrant and refugee families around the Indianapolis community.